Last summer, I was building a smart mirror with a Raspberry Pi, an old monitor and some spyglass. Now, the smart mirror got extended by a voice assistant to become a speaking mirror. As some of you know, I am doing an extra-occupational study for about a year now. 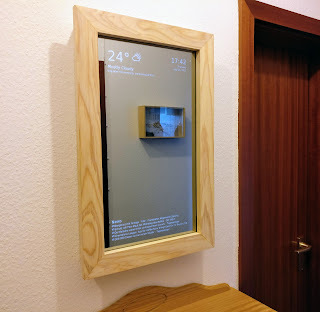 In this case, it was possible to combine the useful with the pleasant as I had to do a case study for my school and I wanted to extend my smart mirror project. The case study was set to be a teamwork of two or three students so I grouped up with a fellow student (Benjamin) to work on this project. How to implement a voice assistant into a smart mirror? What voice assistants are available? How to choose one of them? How to actually implement it? First, we had a working smart mirror which showed weather information, time and date as well as the latest news headlines. It consisted of an old monitor, a wooden frame, a spyglass and a Raspberry Pi. To learn more about that part, check my original post about building a smart mirror. For our case study, we were describing this parts and some other basics like the internet of things and so on of course. The next big question was, which voice assistants are available and which one to choose for the project. Voice assistants are one of the main topics in tech at the moment. Even Google showed up at the CES in Las Vegas this year to present different consumer products that include voice assistants. And even before that, at the Google I/O 2016, Sundararajan Pichai, the CEO of Google, was talking about the importance of voice search and assistants for the future of technology in his keynote: "In the US, on our mobile app in Android, one in five queries — 20% of our queries — are voice queries and that share is growing." Which voice assistants did we look at? How to compare the voice assistants? To compare these assistants we build a list of 46 questions of different kinds which we asked each assistant. The questions where consisting different areas. Following you will find examples of the different categories. "What is the 3rd root of 625?" "What is 5 US-Dollar in Euro?" "What is the difference between bit and byte?" "What is the Brownian motion?" "In which movies did he play?" "What's going on in the cinema today?" "Where is the next cinema?" "What's the time in Bali?" "Are there any events on my calendar?" "How long is my commute?" Each question was asked to each of the assistants up to three times to make sure no other noises, like a car driving by, would have a bad influence on the result. If the question was recognized correctly, no further tries where applied. The questions were also asked by the same person to all assistants to have comparable conditions for each of them. After all the questions have been asked and the results were gathered, we created some graphs to show them in comparison in three different categories. The first category was, how well the spoken question was recognized by the voice assistants. This could be determined by checking the voice log where the text was shown, that the voice assistant recognized. As to see by the graph about the question recognized, Google did recognize the questions always, while Siri and Alexa did a similar, still good job. The second category was whether the question was answered. This had to be split up not only into yes and no but also into a third area "partwise". This was introduced as we recognized how some of the questions were answered but not by voice feedback, rather by showing the result at the display. This graph shows, how well the questions were answered. Again, Google did a very good job in this regard. Alexa did not show any results visually, because of the nature of the device as it had no display. Siri and Google on the other side where tested on devices with a display. The number of answers given by Siri by displaying the information rather than giving voice feedback was surprisingly high. The last category was whether the answer given to the question was fitting and helpful. This was a bit subjective, but we had no disagreement on the judgment here at all. The quality of the answers given was best by Google, followed by Siri. The last useful answers were given by Alexa. All in all, we summed up the positive answers of all categories to get a summary of the graphs in one place. As it's clear to see, Google did best in all categories. A bit more to consider was that Apple had restricted the use of their assistant to use in their devices only which made it impossible to use it for our project. Also a positive aspect we recognized in addition to our questions was, that Google did tell the source of information before answering the questions. This also allows judging if the given answer is trustworthy or not. The Google assistant was the only one to do this. Considering all of this, we decided to use the Google assistant to implement in the smart mirror. So far so good. The implementation and what we have done after selecting an assistant for the project will be part of another article.